get inspired, motivated and encouraged. Welcome to Today Chronicles! Sharing lessons while pursuing my purpose. At those times when you feel most unappreciated (constantly giving but receiving nothing in return); you are tempted to stop giving. In reality, it is at those times we need to remember that the best reward is when we're gifting and blessing others. Even though it feels as if no one notices what you are doing, God notices. TODAY I will upgrade my perspective to GIVE my best effort instead of merely focusing on what I am not GETTING. There are times when it seems like everything you do appears to go wrong. Trouble consistently comes and seems to travel in multiples. However, just when you were about to quit, a reminder comes to help you keep going, like a rainbow in a storm. ​TODAY I will recognize the RAINBOW in the storm. I will be GRATEFUL for experiences that make me stronger; yes, even the unexpected, difficult times. I will learn to become an EXAMPLE of determination to be a BLESSING for others. DO YOU EVER FEEL LIKE A HOT MESS? There are certainly times when nothing seems right, your career, your relationships, your finances and your countenance are all a HOT MESS and you don't feel like there is any hope. However, you watch a renovation show and see how someone brought the beauty back to a rusted out classic car and you realize that God can do the same for you. TODAY I will appreciate the BEAUTY beneath the BLEMISH. I will follow God's example and use it as a FOUNDATION to create something MAGNIFICENT! HAVE YOU LET NEGATIVITY IMPACT YOUR CONFIDENCE? Has there ever been a time where someone said or did something that caused you to second guess yourself? It could have been a parent whom you could never seem to please or someone of authority who seemed unreasonably negative. Whatever the case, the end result was that your self-esteem plummeted. It is important to realize that in your journey there will be times when you are confronted with negativity that could jeopardize your confidence. Please realize that the negative times are preparation toward your future success. Use those negative times to strengthen your resolve by remembering the value you bring to the table. Today I will remember to stand in full confidence in the midst of negativity recognizing the value I bring to my relationships, workplace and community. WHO IS WAITING FOR YOU TO REALIZE YOUR PURPOSE? Have you ever thought that there are people whom you are able to bless through fulfilling YOUR purpose? There could be someone who considered suicide, but your testimony, business or friendship helped them realize that life is worth living. Is self-doubt and fear sabotaging your success? Fulfilling your purpose was designed by God to be a blessing to others. You must fulfill your purpose. Someone is waiting. TODAY, I realize that my purpose is much bigger than myself. 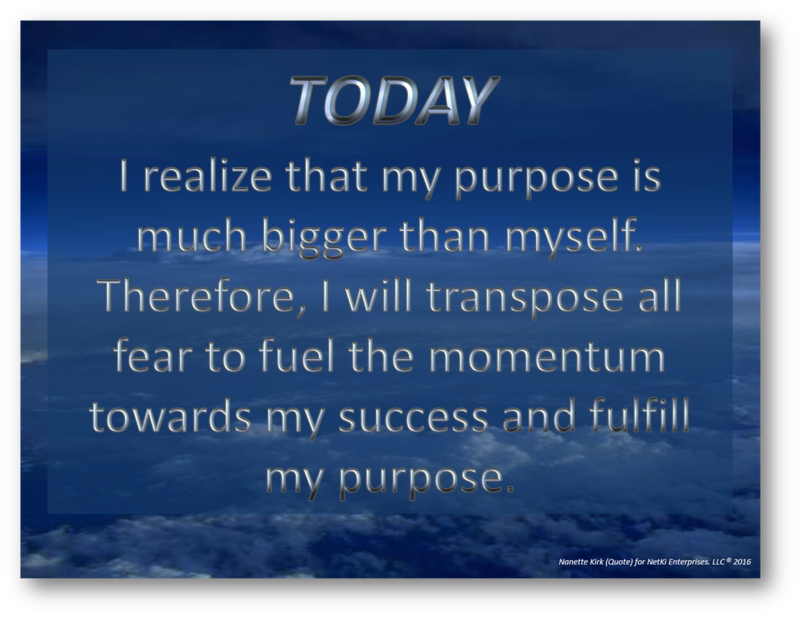 Therefore, I will transpose all fear to fuel the momentum towards my success and fulfill my purpose. HAVE YOU EVER ASKED WHY AM I HERE? You seem to move through life on "auto-function" performing the same daily tasks,ending the day in front of the television or on the computer. Surely God has more for you. Guess what? He does! "For I know the plans I have for you, declares the Lord, plans to prosper you and not harm you, plans to give you hope and a future." Jer. 29:11 NIV. God does have a plan and if you are alive. YOU are in The Plan. So ask Him to reveal to you his plan for your life. TODAY I realize I am a part of God's Plan. I will take advantage of every opportunity that is aligned with the vision of God's Perfect Will for me. I have realized too many times in my life that I have been a people-pleaser. Amazingly enough, it was a friend who recognized it and commented on it. At the time, I thought he was just being “insightful” and that he didn’t really know “me.” I had my own rationalizations about the subject at the time. Throughout the years, his comments resonated with me and made me do some self-analysis. It was at that time I realized that I was a people-pleaser. I didn’t like to disappoint. It was evident in my relationships, at my job or even when I wrote my first book.There are probably a litany of theories on why I did this. None were healthy for my confidence. I realized that trying to please others was not sustainable nor ideal. After seeking guidance from the Lord, I strengthened my relationship with Christ. Soon, I realized that I could be free from seeking approval of others; how God made me is enough. 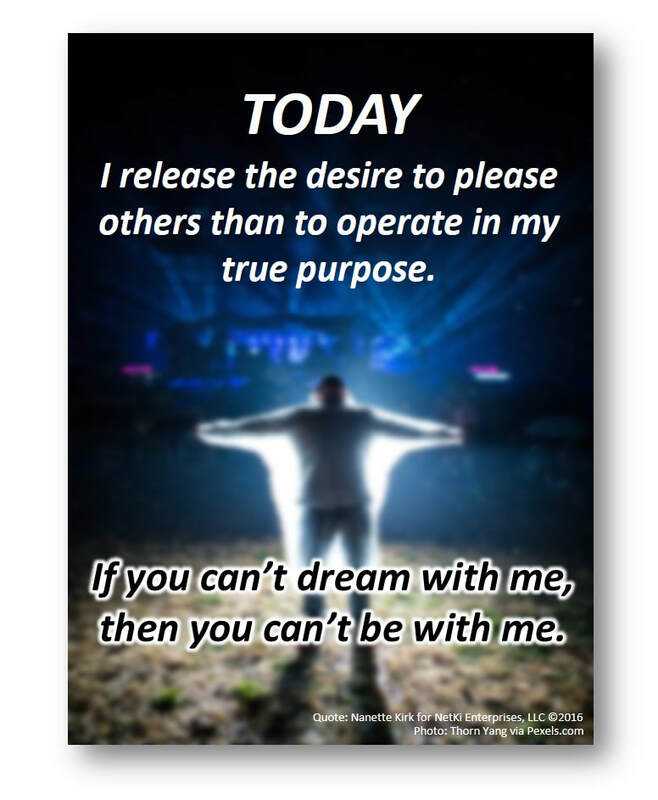 TODAY I release the desire to please others than to operate in my true purpose. If you can't dream with me, then you can't be with me. DO YOU have a problem with trust? I did. I have a history stemming from childhood of people I trusted to make promises, and later not keep them with little or no acknowledgement. I would grow giddy with excitement in anticipation of the fulfilled promise to inevitably being disappointed when the promise wasn’t kept. Disappointment turned to degradation when there were no reasons offered for what I deemed by that time to be a lie. Didn’t I matter? Didn’t I at least deserve an explanation? How could the “good” people whom I trusted to blatantly misuse my innocence? The disappointment crippled my confidence. I decided that I would keep my word and if for some reason I couldn’t, I would at least apologize and try to make amends. I didn’t want anyone to feel the same pain. As an adult, I realized the betrayal I felt could manifest into bitterness that would negatively affect me in many ways; In my health, relationships, spiritually and even my career. I poured out my heart to The Most High for help and sought to forgive those who hurt me. I learned that I didn’t have to be bitter. I also learned that someone else’s unfulfilled promises didn’t reflect on me as a person or that they are completely terrible people. They are imperfectly human. Like me. TODAY I choose peace. I realize that bitterness from betrayal of trust is not worth the consequences nor a reflection of me. I will trust The Most High and forgive those who hurt me. They are not perfect and neither am I.
sign up to Get the today Chronicles in our newsletter!